SC_-_First_Ride.JPGFirst Helo RideMy first helicopter ride ever in Vietnam was in an OH-23 Hiller, also known as the "bubble" chopper. 2-9_company_clerks.JPGBattery Clerks of the 2/9th(L to R) Richard G. Castaneda, "C" Battery clerk; Sp5 Robert F. Biza, "B" Battery clerk; Sp5 Ronald N. Tune, "A" Battery clerk; Sp5 James L. Keller, Hq Svc Battery clerk. A sure sign that the Headquarters were "getting civilized" with all these stateside amenities. Battery_Clerk.JPGBattery Clerks of the 2/9th ArtyAlmost looks like he's working stateside. He's James L. Keller, 2/9th Hq, Svc Battery. Photo dated 1969. Battery_Clerk2.JPGBattery Clerks of the 2/9th ArtyA true desk jockey...name unknown...but not any more. 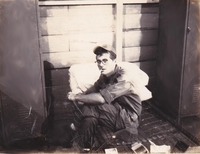 Thanks to Sp5 James Keller, we now know that this is Sp5 Robert F. Biza, "B" Battery clerk. Typewriter.JPGBattery Clerks of the 2/9th ArtyOne tap or two? The best way to repair a typewriter. This is how Sp5 Robert F. Biza repairs his Hq Service Battery typewriter. Biza's name provided by Sp5 James Keller in November, 2014. So, now we know. Ron_Watts.JPGDecember, 1968: Unusual AssignmentRon Watts, a member of the 2/9th, spent his whole tour with the 1/69th Armor. Lea_1268.JPGPFC Eugene E. LeaDecember, 1968. My friend Eugene Lea. Tents.JPGHome Sweet HomeDecember, 1968. These were the tents we lived in. Robert_L__Brown.jpgGoing on R&RPFC Robert L. Brown is in the locker room getting ready to leave for R&R. He was from Milwaukee, WI. David_Jacobs.jpgSp4 David Jacobs, with towel, was the switchboard operator. Mark Charters is reading a book over to the right. The one on the upper bunk is UNK. This area was the common hut. Jesse White slept here also. Anyone know the unknown soldier? Paul_Howe___parrot.JPGAnother Nam buddyPaul Howe with a parrot on his shoulder. Note the shield of the 2/9th on his left jacket pocket. Paul_Howe_with_boy.JPGMan and boyPaul Howe sits and chats with a young boy scout. Behind them is the ubiquitous concertina wire to identify a perimeter.